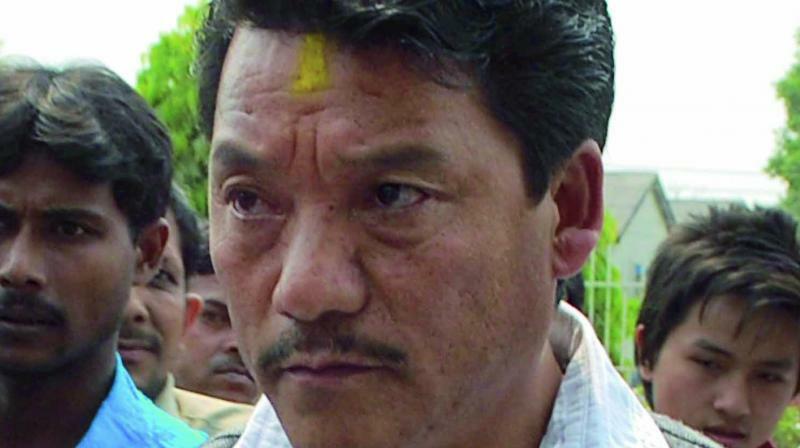 Darjeeling: Bimal Gurung on Friday said he was not finding people who used to "crowd" around him to "share my problems" these days, amid the steady flow of his supporters to the Binay Tamang camp. In an audio clip circulated by Gorkha Janmukti Morcha general secretary Roshan Giri, Gurung said: "When the going was good, when things were comfortable, they used to crowd around me, discuss things and poured their thoughts out. But today, during these tiring days, I am not finding these people to share my problems." "I feel sad," Gurung said. "I am fighting for the emancipation of the community and not for self interest." The Morcha president continued to pin his hopes on the BJP, though the party has maintained a stoic silence on its stand on statehood in the 104 days of the shutdown. "Good days will definitely come. The central government and the BJP are thinking something for us. There might be some delay, but it will definitely be good," said Gurung, who also appealed to the hill people to have patience. Gurung's tone clearly suggested that he was getting rattled with the day-to-day happenings in the hills as the Tamang lobby have been drawing significant crowds at meetings. Over the past one week, several trusted lieutenants of Gurung have joined the rebel camp. Bimal Gurung on Friday said he was not finding people who used to "crowd" around him to "share my problems" these days, amid the steady flow of his supporters to the Binay Tamang camp.